Yesterday I woke at 7:00 and, once again, stayed in bed until the anxiety passed. I meditated for twenty minutes, focusing on the breath and relaxation. I let the dogs out and made coffee. Coffee works its magic by returning my optimism to me, especially if I make it half decaffeinated. A little goes a long way. But the sink full of last night’s dirty dishes soured my mood. I had asked for help, but the men in my family see no problem with leaving the countertops dirty for a day or two. Since I’m the one with the problem, I end up cleaning, and I’m left with resentment. On top of the dirty dishes, I had to forgo working on my Camino travelogue so that I could drive my father to the hospital. He has a staph infection in one of his heart valves, but he refuses any more surgery. His only other option is to go to the hospital every day for six weeks to receive an infusion of antibiotics that go directly to his heart. His insurance won’t pay for in-home care because he is “ambulatory,” but he’s too weak to drive. My siblings and I are sharing the daily driving with my father’s wife (my parents divorced years ago) so that she doesn’t have to do it all. I know Freeboarder’s right. I know I have to help my father, in spite of our fraught relationship over the years. I have to help him because he is a part of me, because he is at the end of his life, and because underneath his stoicism he couldn’t help but be afraid. This is one of those moments in life when to help might create momentary resentment that in the long run contributes to overall happiness. So I brought Dad homemade tomato and roasted red pepper soup and made him a few grilled cheese sandwiches. On the way into the center, while I was parking the car, Dad almost fell. He walks with a cane and has arthritis in his spine and neck, so he might have stumbled, or he might have felt faint from weakness. But a male nurse happened to be walking right next to him as Dad started to go down, and the nurse caught him. After Dad and I left the cancer center where he’s receiving his treatments, the sun was still bluing the sky at 4:30, however faintly. We were both still alive. We marveled at the miracle of the nurse who caught his fall, a guardian angel who appeared at the right moment to spare Dad more pain. When you decide you’re going to make a pilgrimage, you’ve already begun it. Every step you take is a preparation for the day when you take that first step on the desired path; mentally, in your heart and mind, you’re already there. It’s not that your mind is elsewhere, but that you have invited the pilgrimage into your daily life. Not only that, when you decide to go on this path, you make it that much easier for someone else to begin. We raise consciousness together, one person at a time. In 2015, I’m planning to hike 500 plus miles across the north of Spain, from St. Jean Pied Port to Santiago de Compostelas. Emilio Estevez’s film “The Way,” starring his father, Martin Sheen, has recently popularized this ancient pilgrimage. Called el Camino de Santiago in Spanish, or el Camino Francés, in English it translates as the Way of St. James. My reasons for making this pilgrimage vary. I was raised in a traditional, Catholic family, although I am not a practicing Catholic. Maybe because I spent so much time in candle-lit churches, I feel a strong connection to the poetry of Catholic mystics St. Teresa de Avila and St. John of the Cross. But a long time ago I became disenchanted with what I perceived as the dogma and rigidity of Catholicism. And I have some wounds related to my upbringing that keep me from embracing this faith. I also disagree with some of the basic church policies about women’s reproductive health and the ordination of women. Today, my spiritual life centers around mindfulness meditation, long walks in nature, and cultivating peace and love in the world. But my hope is that by walking 15- to 20-miles a day, from cathedral to cathedral, I will reclaim my childhood religion in my own way, on my own terms. No man-made set of rules can or should prevent me from experiencing the divine as I walk across Spain or as I hike up Kennesaw Mountain, the place where my pilgrimage has started. Yesterday, Elizabeth started yoga class with a meditation. She asked us to think about our “feeling-tone” and to notice how it felt to be us at that particular moment. She said she was referring to lessons she learned from her teacher, Erich Schiffmann, who writes about levels of stillness in his book, Yoga, The Spirit and Practice of Moving into Stillness. Elizabeth put her instructions to us within the context of the New Year and the Western tradition of making New Year’s resolutions. She suggested that we learn to accept our current feeling-tone, to even celebrate it, while being open to the potential for change. This is a much different way of looking at goal setting and resolutions. A gentle, self-accepting approach. In yoga we often refer to sankalpa, a sanskrit term that is roughly translated as a resolve or an intention. During a state of deep relaxation, the yogini forms an intention, and then keeps that intention alive in her heart until she realizes it. At the end of class Elizabeth recalled us to our initial feeling-tone, and again asked us to think about our potential for change. She asked us to think about an intention for the coming year that would involve our feeling-tone, and then she offered us a talisman to keep as a physical reminder of our sankalpa. She had drawn symbols on smooth glass stones of different colors–the OM symbol, flowers, a peace sign, a cross, etc…, and she then had us choose a stone from her selection. 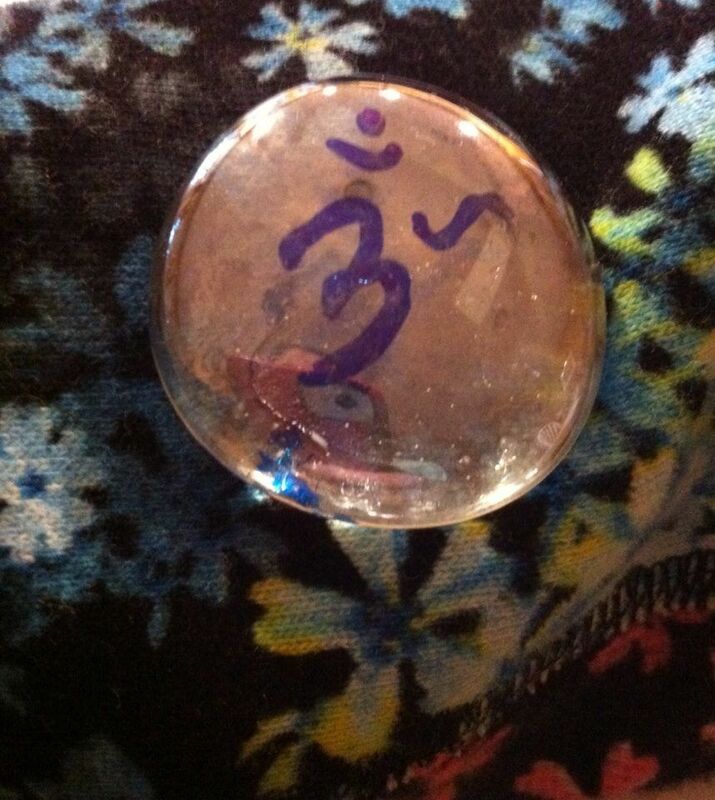 I chose a clear stone with the OM symbol. My sankalpa is to cultivate a clear mind, clear speech, and a clear heart/body. I intend to meditate every day to tune into pure, clear awareness, to dive beneath the waves of mind chatter and to listen for the deep hum of primordial sound. Peaceful mind, peaceful heart, peaceful speech, peaceful actions. Mindful Writing Day 10, Writing Your Way Home.